We started our Tuesday with a trip to a shopping center. Aykut and the driver (who’s name we are seemingly not allowed to know) pick us up at 8:30am. We went to a higher end shopping district to see the cistern underneath. It was not as spectacular as the cistern from yesterday, but they did have a lot of artifacts and ancient pottery there that was found when the cistern was rediscovered in the 19th Century. 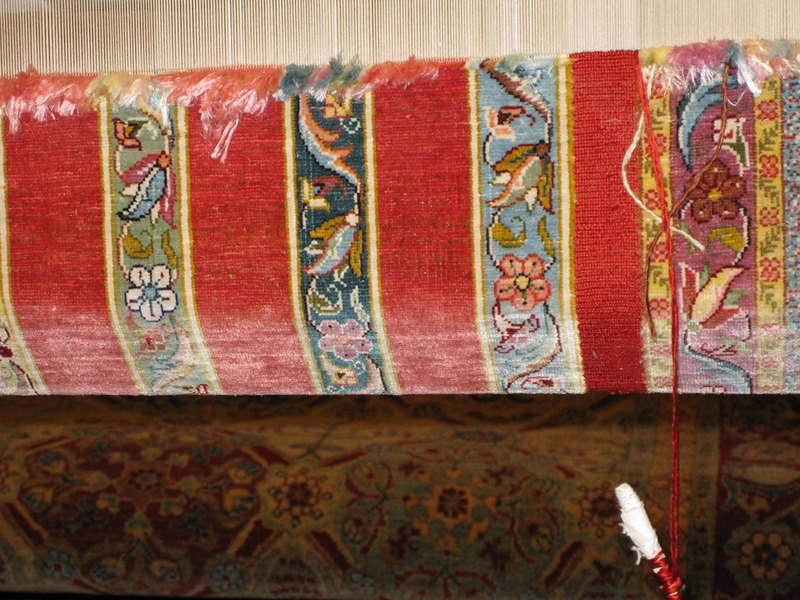 The highlight of the trip was watching a Turkish rug making demonstration. The woman was working so fast and seeming to follow a pattern but I’m not sure how she could tell where she was at. A true talent. 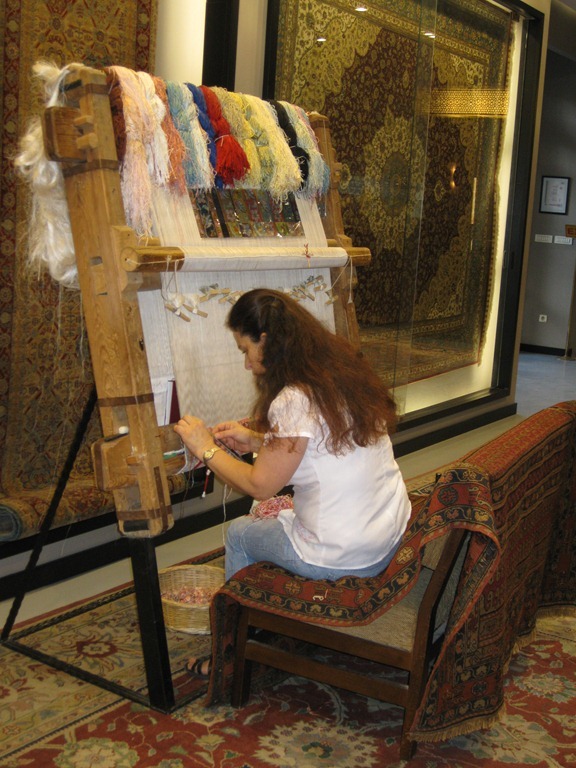 She will work at it for a few hours everyday until her fingers are tired and this particular rug will take her 16 months to finish. Our morning “program” as Aykut calls it, was a meandering boat tour of the Bosphorus River. We started at Galata Bridge and ended at the Black Sea. We had a great view of the historical palaces of Istanbul. From Topkapi which represents the beginning of the empire to the Dolmabahce Palace, the construction of which was solely responsible for the economic downfall of the Ottoman Empire. 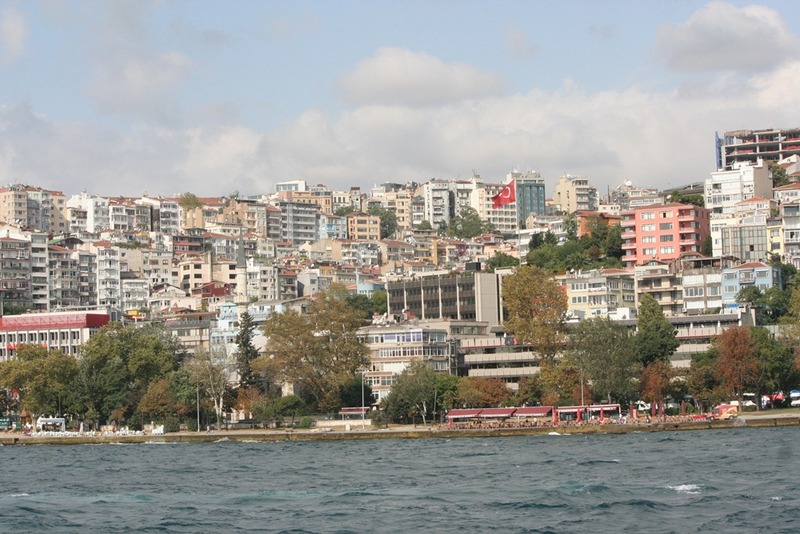 We rode the boat for 30km (18 miles) and got a first hand look at exactly how densely populated Istanbul really is. We got off the boat in a small fishing village at the end of the Bosphorus. It is the last stop before the Black Sea and the DMZ. Aykut had lined up lunch for us at a local restaurant and our driver met us there with the bus. We all tried Bonito, which is a local fish delicacy. It came with the tail and face still on it. It was pretty much a whole fish just cut in half and pan fried. After lunch we wandered town a bit and then took the bus to the Asia side of town. Certainly a lot slower paced over there. Not so much hussle and bussle of commerce that the European side has. Mom, Dad and I all got dropped off at the ferry crossing to get back to the heart of the city and the others kept touring the Asian side. Dad went back to the hotel to rest and Mom and I took off to the Suleymaniye Mosque. It was prayer time when we got there so we walked the grounds that surrounded the mosque. Beautiful park and graveyard. The adjacent street is known as “Addicts Alley” for it’s once booming opium distribution. Now, it just has a few cafes and shops, I fed my addiction there and bought some postcards to do some more writing. After that, Mom and I took and extensive tour of the University of Istanbul campus. Lot’s of kids using the outdoors and chatting on the street (I’m assuming there are not to many co-ed dorms here). We got an opportunity to practice our Spanish when we ran into a couple of Spaniards who were headed the same place as us and were also in need of directions. 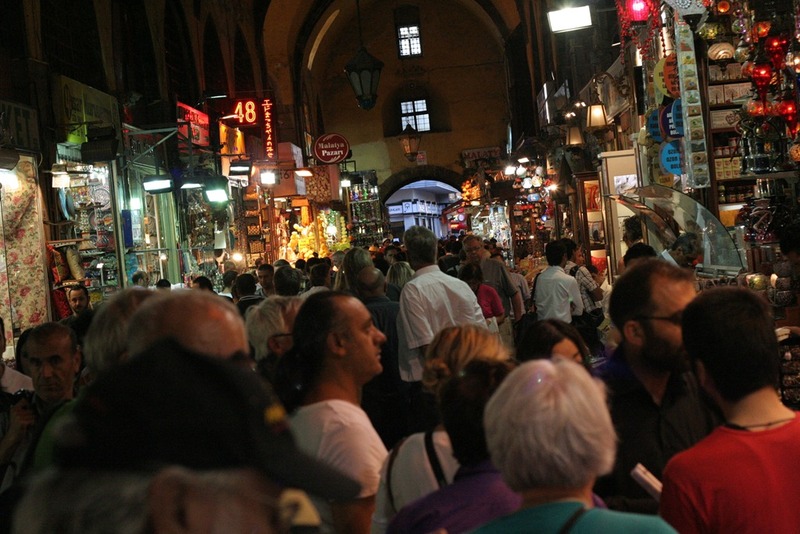 Together we all found our destination; The Grand Bazaar. It is a truly remarkable place. It’s the Las Vegas of the Middle East. Flashy lights and loud people trying to get your attention. Every color of everything imaginable. After the sensory overload of the Grand Bazaar we were a bit turned around and took off in a very wrong direction. By the time we realized it we had found a restaurant with a very helpful gentleman who informed us “Oh, Honey Bunny, You’re not even close to where you want to be!” But he not only gave us great directions but he told my Mom that I was beautiful and asked if he could take me out dancing tonight (Very flattering, but my feet are killing me from all of this being lost business). We headed back to the hotel and soaked our aching feet. Off the write some of those postcards now! Now, It’s Istanbul, Not Constantinople. You should definitely bring home a rug like that. Great pics! Sounds so amazing, all the sights, foods and people. The religion is interestng for sure. And the photos are beautiful. So glad your having a good time and getting some shopping in (Grand Bazaar) way cool.